Light, floating down like a feather. 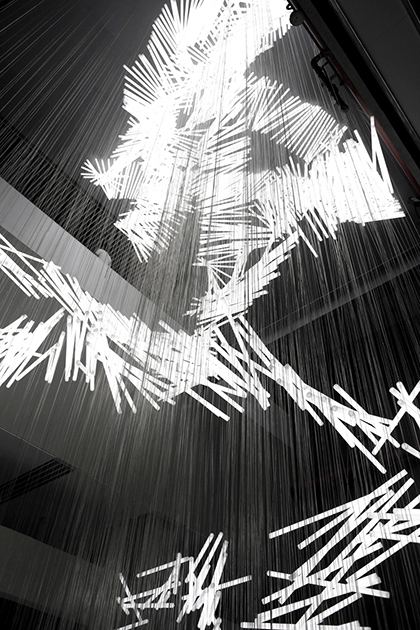 The artist creates a virtual environment in the computer with it's own weight and gravitational pull, with in this environment, a fluorescent light tube falls much like a feather. Within this environment the falling progress of the tube can be precisely documented with accurate calculations and figures. Therefore, the artist will use one set of these calculation to make a stop motion sculpture that shows the falling process of the tube, as in from from point a to point b, and in between there are over thousands of tubes installed that represent the position of the falling at given time. At the same time, the process of falling is as organic in his virtual world as in the real world, therefore, there are many variables that produces many different results in the process of falling, these many processes are then calculated to printed out through out the exhibition and pasted onto the wall to represent the numbers of potential different out come. On view, the viewer will see one giant light installation that represent the falling of the light tube (feather) made from the virtual environment. And also a computer that continually calculate and produce drawings of different out comes and processes of the falling tube. The idea is to make the concept with tenable data from a supposed virtual environment, therefore, grounding something that is theoretical to reality.